When I recently received an invitation to attend the open day for the brand new Rochester Studio in Kent by a guy called Gino, I agreed to pop along and see the facility. I wasn’t sure that my work would ever be a suitable theme to shoot in a nice studio given that my work is so messy, dark, and horrific. I was convinced that I’d never actually use the studio, certain in my belief that the new owners would not be happy if I left huge blood splats up their white curved walls or chopped limbs all over their 1940s set. The studio was a very impressive place, with plenty of creative spaces to suit a variety of styles. To my amazement, even horror had been catered for with an old, spooky broken-down lift sitting eerily in the corner like a hellish man-trap. On top of that, some derelict rooms at the back of the studio really got my interest. And so, having arrived out of politeness, keen to see the place but with no expectation to ever use the studio, I left full of excitement and couldn’t wait to get myself a shoot in that place! It’s nice that life can still surprise me. 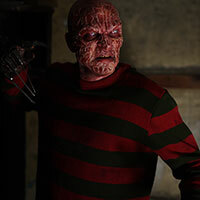 I decided to do a new Freddy Krueger shoot, using the grunge and the shadowy corners of some of the facility as a perfect backdrop to a nightmare. 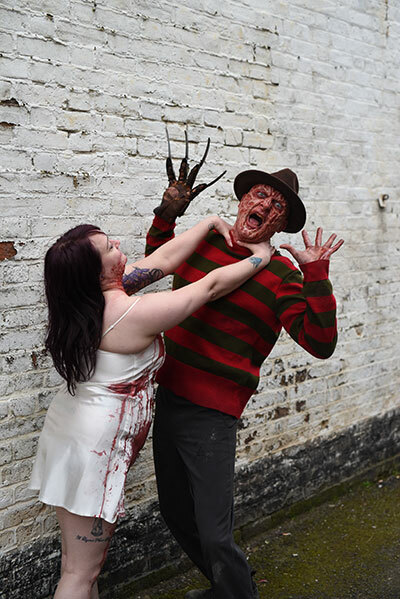 It was also a good practical choice as I didn’t have to get too bloody with a Freddy shoot so the mess could be contained. 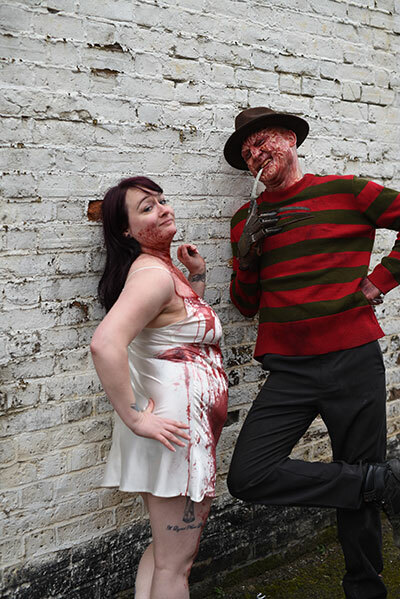 Gemma Turner came along with her little nightgown to be the dream victim, and Mike Butler (who Photoshoot Magazine readers may remember from issue 9, Dawn of the Dead cover) came along to be Freddy. 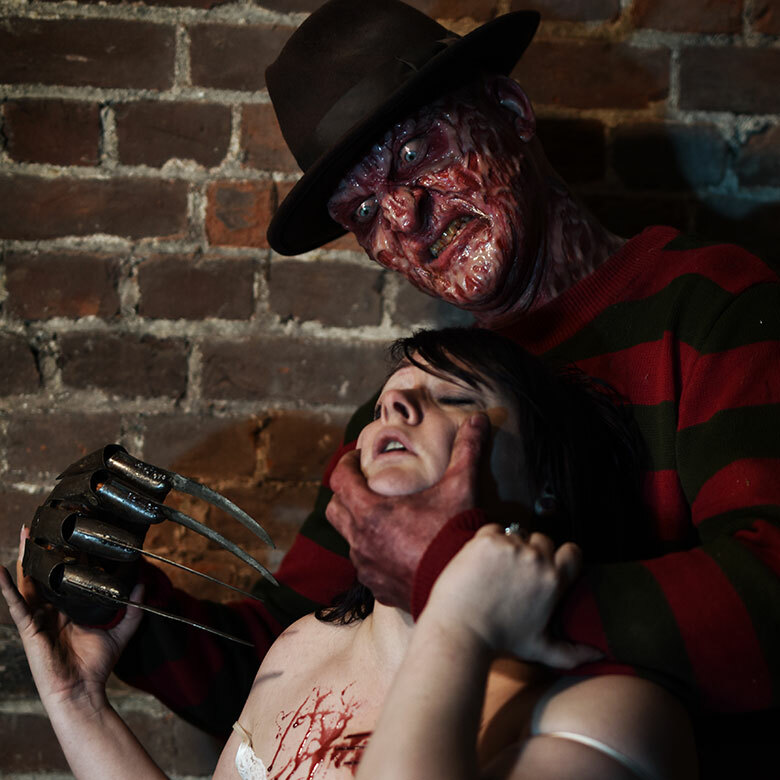 I’ve done several Freddy shoots before, and I’ve always been happy with them. 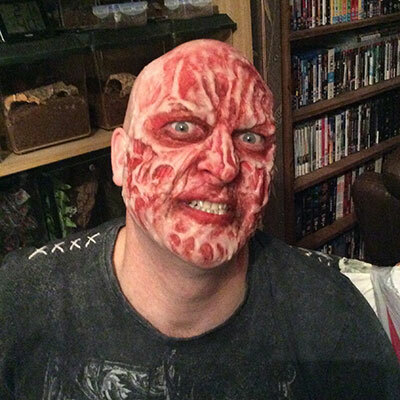 Freddy makeup is just one of those things I’ve become good at over the years, having done so many of them. 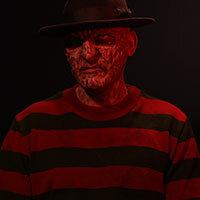 Mike spent a week studying Robert Englund’s Freddy poses which are quite specific. Freddy stands with angled shoulders (originally caused by the heavy weight of the metal glove), a craned neck, and what I describe as a “sneering” posture (a term I’ve made up so don’t go looking it up). 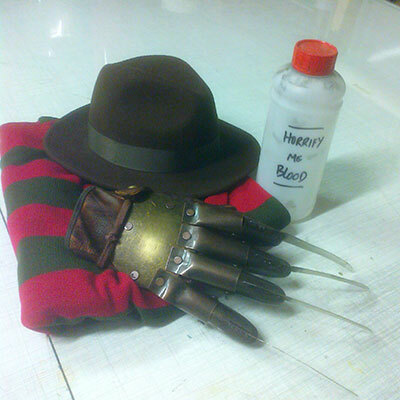 I always craft makeup from the kit box so Freddy makeup is always pretty slow to do. I spent four hours Freddying Mike’s face and forehead, starting at the ungodly hour of 6am. We arrived at the studio (an hour’s drive) all ready to go. Two of the studio bosses, Dan and Zoe, attended the shoot and made sure that all our needs were met. They were so helpful, and great people to work with. One thing that I quickly discovered was that the rooms were very challenging to light. This is no fault of the studio facility, these rooms would be easy to light with studio flashes and high key lighting, but I specialise almost exclusively in low key lighting which is pretty straightforward in a backdrop set, but in spooky little dark rooms it meant figuring out puzzles of where to put what to achieve the best effect. Once we were up and running, seeing Freddy lurking around in the dark like a grisly phantom was equally exciting and unsettling. The little glimmers of light and the metallic clicks from the razor glove, the beaten old fedora, and of course that clashing red and green sweater, set against such an authentic background, was an incredible experience. I’ve since heard that Rochester Studio are planning to build a large horror dungeon set, so it looks like I may be finding a new home for many of my future shoots. Watch this space! 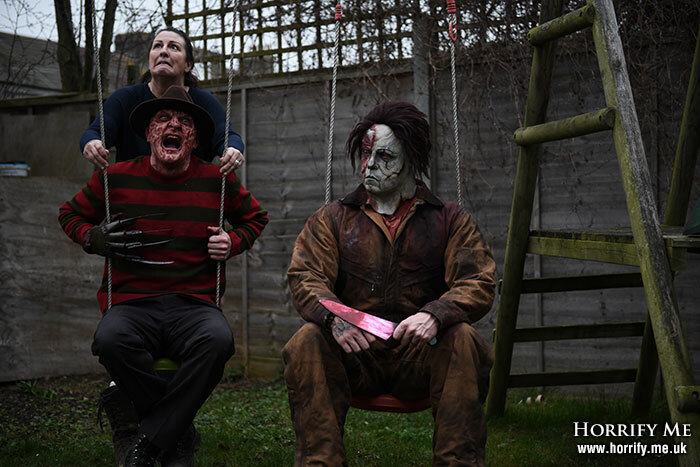 Final note - after we completed this shoot, we took Freddy to see our pal Michel Myers (the killer from Halloween), real name Keith Larkin. I thought it would be epic to have two of the horror world’s most iconic slashers working together. The visions of carnage and horror that filled my head were immense! And what happened? They wanted to play on the swings. Sigh…..